← What kinds of grand futures are there? It’s counter-intuitive, but the packing density doesn’t change with the scale of an object. Small spheres pack at the same density as large spheres. Density is a dimensionless measure. Imagine a picture of packed circles, but you don’t know the scale. You can still calculate the density, right? So when you find out each circle has a radius of 1km, or 1mm, it doesn’t change the density you calculated initially. That is an impressive amount of energy in that compaction. I never thought of cooking with gravity before. Maybe for the next 4th of July, we can replace the planet with hotdogs and burger patties, for an excellent barbecue. 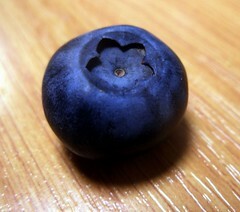 If we model the blueberries as regularly packed spheres tiling an infinite volume, the volume fraction of air should be constant with the berry radius. Is there something I’m missing? Thank you, Mr Sandberg, Thank you. You’ve made my day.